I don’t know how journeying the length of the Amazon River first came into our minds but once the idea was there, it was hard to ignore. But, I’m getting ahead of myself, let’s start from the beginning shall we? It was never in our plans, and we weren't even sure it could be done. When we asked around we were met consistently with shaking heads and nervous laughter from both travellers and locals alike. They told us it was impossible, but at 19 we were irrationally confident enough in our youth and freedom to ignore the naysayers. 18 days and 7 boats later, we proved everyone wrong. Lesson 1. Impossible has different limitations where travel is concerned. The first 4 day voyage on the Rio Huallaga in Northern Peru was quiet, with only a handful of locals but a generous supply of stunning sunsets and moonlit nightscapes. We quickly settled into the swing of things, quite literally, in our colorful, hand-woven hammocks. We had bought them, along with a spoon and bowl, in preparation for the trip, knowing they’d be all we would need for this particular adventure. You see, hitching on cargo boats is a legitimate business on the Amazon. 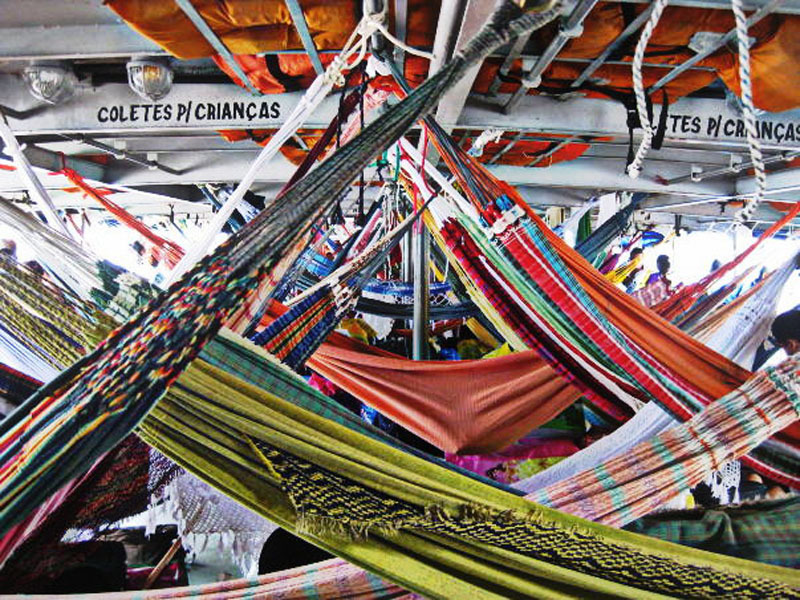 You buy a ticket at the port, string your hammock up from the rafters and offer up a bowl at the communal meal times. You may just have to share your space with a thousand bananas or a cow or two. 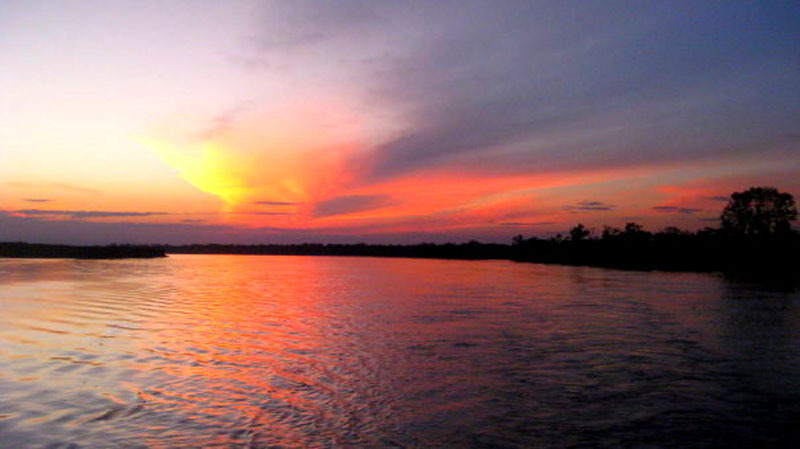 Cargo boats are no luxury cruise; the accommodation, the food and the amenities are all very simple, but you are still face to face with the great Amazon, river and jungle, for a fraction of the price of a guided tour. Our days rolled along as calmly as the boats on the water. We napped, we snacked, and we read; we wrote, we talked and we played cards, all the while taking in the snippets of life we could see drifting past. Dense green jungle, stretching out wildly from the murky shore. Lesson 2. 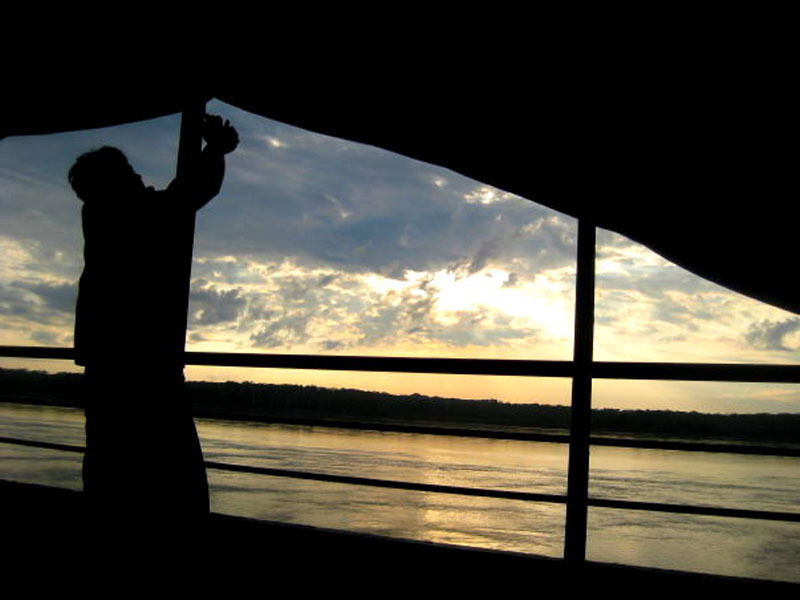 Amazonian cargo boat may just be the most relaxing way to travel. It wasn't until we crossed the border into Brazil, that things started to get interesting. First, there was coffee. Second, and most important, there was a rooftop bar. After days of simplicity, it was like stepping onto a cruise, and with these few luxuries came a lot more people. We sat up late into the night, watching the sky burn and then twinkle, drinking beer after beer after beer and, of course, talking about travel. Two police raids and a frisking later we were soon brought back down to earth. I guess something about cargo boats many hiding places and our proximity to a certain country make the police around those parts a little suspicious. As they separated the men from the women and began searching our bags, I caught myself trying to explain to the extraordinarily grumpy official that my Tampax was not a cleverly disguised, well, anything. Lesson 3. Being deft at charades may be helpful in surprising travel situations. Presumably finding nothing of interest, we were soon-ish on our way, a mere 6 hours late. Before we knew it we were stepping off our final boat, at the Atlantic Coast, and trying to figure out how we might possibly get to Rio in time for Carnival without emptying our pockets too deeply. We’d started our trip in Peru on an organized tour, with an organized itinerary and organized meals. A couple of months later we were successfully navigating one of the world’s largest rivers, negotiating with local police and sharing our own travel stories with the nomads we met along the way. Travel has an incredible way of making you grow in ways you didn't realize you could. As the world opens up in front of you, you open up to the world and it is then, when you feel calmer and more in control of your journey, that the most amazing and surprising encounters occur. Lesson 4. Travel will change you. You will be more confident, more self-reliant, more yourself. Because every day is a school day right? 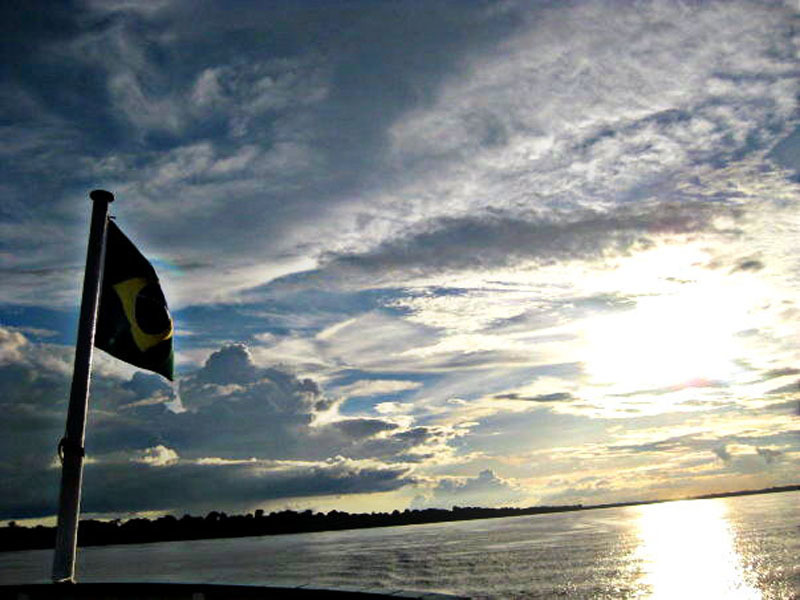 Even 1000km down the Amazon river. Jade House is a 23 year old travel addict from England. 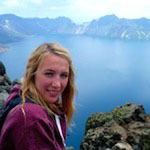 Her previous adventures have taken her to South America, South East Asia, East Africa, China and Australia which she blogs about at Journeycount. She is currently teaching English in Korea but is already dreaming up her next big adventure with her boyfriend and travel partner in crime. Nepal and India may be on the cards. As well as on her blog, you can reach her on Twitter, Instagram and Facebook. 10 Responses to "Lessons Learned from the Mighty Amazon River"
Great article. Really makes me reflect on how travel has changed my life. Thanks! So envious of your adventure! 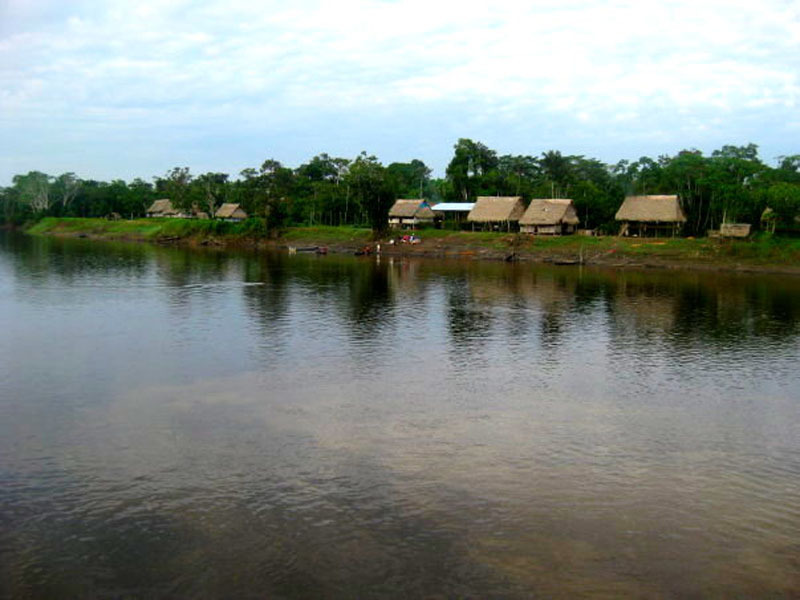 I spent a week travelling down and camping in the Peruvian Amazon in 2009. My favourite memory is waking up in my hammock just before down and looking out to see pink river dolphins swimming alongside the ferry. Beautiful writing Jade. One of the reasons I love to travel is because I learn so much about the world and myself each and every single day. More than I could ever learn just sitting at home reading and watching tv. Great post – I love the re-telling of the funny frisking incident! Thanks Emily, I had a laugh reminiscing about it! That sounds incredible. I’d never even heard of getting passage on cargo ships on the Amazon, but it sounds like such a peaceful way to travel – aside from the occasional police raid of course! This is also probably one of the best customs stories I’ve ever heard. Thanks for sharing! We hadn’t either until we got to Peru! It was a few years ago now but I hope it’s still the same today as it really was an amazing way to travel.